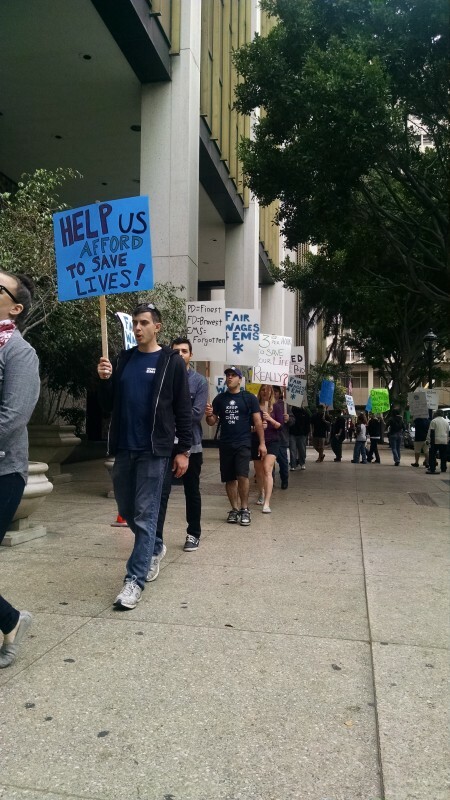 On June 1, 2015 over 80 EMS professionals showed up outside a San Diego city council meeting. The members organized in an effort to persuade the city council to reject a proposal to give Rural / Metro Ambulance a five-year extension and instead declare a 60-day cooling off period in which to settle a contentious labor dispute. Despite our members’ best efforts, the city council did extend the contract with Rural / Metro for the next five years. Jen Restle, President of NAGE EMS Local R6-19, spoke before the council on several key issues her members have faced for years. President Restle has been paving the way for EMS employees in San Diego, stating that some members work upwards of 80 hours per week at multiple jobs just to make ends meet. Restle commented, “EMS workers are paid hourly to save people’s lives…We are here to ask for a livable wage. Many of my members have 2 or even 3 jobs and still have trouble feeding their families.” Many EMTs start off making only $10 per hour. Although NAGE EMS was unable to convince the city council to reject the Rural / Metro extension, Local R6-19 was able to push their message of fair wages for EMS employees forward and garner public support. They will continue with negotiations and other actions in an effort to reach a satisfactory contract agreement.